As a musical form, the requiem tends to inspire composers to high drama. The occasion practically requires it: Requiems are the Catholic Latin Mass for the dead, usually sung by a choir and soloists with full orchestra. Why hold back when you're setting to music, say, verses on the "Day of Wrath" ("Dies Irae") — that is, Judgment Day? Verdi knew this, as did Berlioz and Mozart before him. But all these composers' requiems were in some measure influenced by an earlier one by the Paris-based composer François-Joseph Gossec. With its dramatic "Dies Irae," in which the choir imitates trembling by singing in pulses, Gossec's Grande Messe des Morts launched the requiem as concert oratorio. The work made such an impact in 1760, when Gossec composed it at age 26, that in 1789, in the month following the storming of the Bastille, it was played three times around Paris to commemorate the Revolution's fallen. Regularly played in France, the work is largely forgotten in this country — or was, until the Burlington Choral Society's artistic director, Richard Riley, discovered it on YouTube. 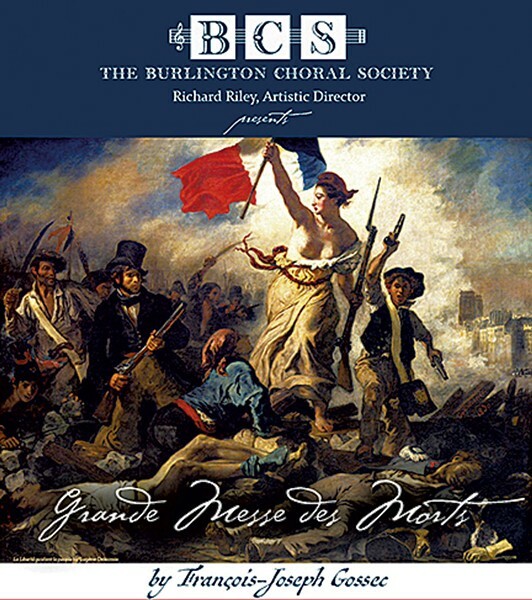 When the 90-member BCS performs Gossec's requiem with the Burlington Chamber Orchestra this Saturday, the performance will be the first outside Europe since 1977, says Riley. It will feature soloists Mary Bonhag, the soprano cofounder of Warren-based Scrag Mountain Music; Milton siblings Melissa and Benjamin Dickerson, soprano and baritone; and tenor Matthew Anderson of Boston. Riley marvels that Gossec has been so "enormously off our radar. He was absolutely central to music at that time." Boldly experimental, Gossec began composing string quartets at the dawn of the genre along with his contemporary Haydn, though it was the latter who became known as the form's "father." Gossec's symphonies greatly impressed Mozart, 22 years his junior, who traveled to Paris to visit the older composer. "And I love the fact that [Gossec] becomes the house composer for the French Revolution," Riley adds. Gossec's military tunes, hymns and a funeral march became what the director calls "the soundtrack that inspired the people of France." The military tunes, written for wind ensembles, have an early precedent in the requiem. For its "Tuba Mirum," Gossec places a small ensemble of clarinet, trumpets and trombones offstage to evoke the distant fires of hell. As Riley begins to tell the story of how Gossec managed to stash this ensemble beneath the floor of the church for the work's premiere, he drops the phone. "I was getting excited and starting to gesticulate with the phone," he explains when he comes back on. "It's an occupational hazard." BCS president and bass singer Owen Brady became equally enthused when he heard the YouTube recording of the requiem that Riley passed around to the singers. "It's passionate and playful, and there are a lot of stirring moments and ... extended runs of notes," says Brady, 27. An account representative at Vermont Gas, Brady has never sung a requiem. The University of Vermont grad joined BCS just over a year ago and had begun singing only six months before that; he studied voice with Victoria Drew of Burlington and then Bill Reed of South Burlington. "I had wanted to be an opera singer since I was young, but I thought I had no sense of pitch," Brady says, explaining his plunge into lessons with professionals. Gossec, who was born a peasant, wrote music for just such aspiring amateurs. He founded the orchestra Concert des Amateurs in 1770 and directed it until 1773. He rewrote his "Hymne à l'être suprême" when Maximilien de Robespierre, then head of the Revolutionary government, objected to its difficulty for amateur singers. "He was a true humanist who wanted music to represent all possible aspirations of society," says Riley. The BCS is set to accomplish that aim in its revival of this beautiful work.